Photo courtesy of Main Street Cupertino's Holiday on Main. Main Street Cupertino’s annual “Holiday on Main” event returns Saturday, Dec. 1 at 3 p.m., with a tree lighting set for 7 p.m.
Family, friends and neighbors are invited to Main Street Cupertino, 19429 Stevens Creek Blvd., to kick off the holiday season and participate in fun activities for all ages. Activities will include musical entertainment, free photos with Santa Claus, arts and crafts, bounce houses, a hot chocolate bar and more. Local radio station Mix 106 will also on hand accepting toy donations to benefit children at Lucile Packard Children’s Hospital Stanford. For more information about the event, click here. 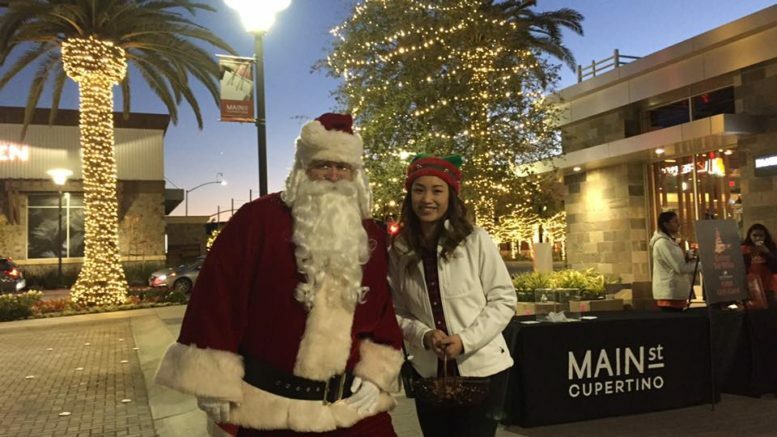 Be the first to comment on "Tree lighting and more at Main Street Cupertino’s Holiday on Main"
Fill out the form below to subscribe for an email alert covering the week's top stories.